WBA 147lb champion Keith Thurman (25-0, 21 KOs) gave Robert “The Ghost” Guerrero (32-3-1, 18 KOs) a methodical beating in winning a 12 round unanimous decision tonight in their fight on NBC in the Premier Boxing Champion series at the MGM Grand in Las Vegas, Nevada. The judges scored the fight 120-107, 118-109 and 118-108. Guerrero was cut over his left eye and knocked down in the 9th round after getting tagged hard by a left hand from Thurman. In the 3rd, Thurman and Guerrero rammed heads with each other, leaving Thurman was a big goose egg on the left side of his forehead. Guerrero was able to land a lot of shots, but his lack resulted in Thurman being able to dominate the action without worry of getting stunned like he was in his fights against Jesus Soto Karass and Diego Chavez. Thurman landed a lot of really hard shots in the fight, but Guerrero was able to take the punches well. Thurman tended to get on his bike each time he was hit solid by Guerrero, and this caused the fans to boo him at times. 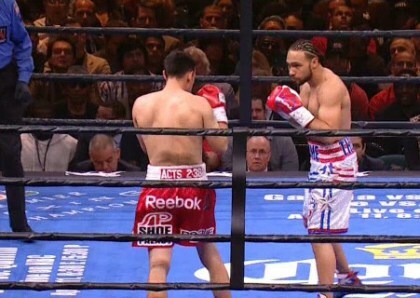 In the second half of the fight, Thurman moved a little too much and it took away from his performance. Guerrero did a good job of getting up from a 9th round knockdown to put pressure on Thurman in the last three rounds of the fight. Oddly enough, Thurman showed little heart for trying to finish Guerrero off. In a disappointing fight, former three division world champion Adrien Broner (30-1, 22 KOs) showboated his way to a 12 round unanimous decision over a listless John Molina (27-6, 22 KOs). Getting Molina to throw punches proved to be next to impossible for his corner, as he seemed afraid to let his hands go. Molina only rarely threw shots in the fight, and he seemed to be afraid of getting countered by Broner. Molina’s lack of hand speed hurt him in the fight, because he frequently missed with his right hand shots. The judges’ scores were 120-108, 120-108, and 118-110. This was a really difficult fight to watch, and I wouldn’t be surprised if some of the casual fans who saw the fight on NBC choose to never watch another fight. Broner’s adviser Al Haymon should have done a better job of selecting an opponent for Broner, because Molina had lost his last two fights coming into tonight’s bout. In other words, Molina was totally unqualified for fighting a guy like Broner. Hopefully, Haymon matches Broner tough in his next fight against an actual contender rather than a 2nd tier fighter coming off of back to back losses again. Featherweight Abner Mares (29-1-1, 15 KOs) won his third straight fight against his third straight 2nd tier opponent in beating an over-matched Arturo Santos Reyes (18-5, 5 KOs) by a 10 round unanimous decision. The judges’ scores were 96-93, 99-91 and 99-90. Mares knocked Reyes down in the 2nd round. Other than that, it was a boring fight without much interesting action.